Info:Ulf Christiansson: vocals, guitar | Michael Ulvsgärd: drums, back vocals | Peter Carlsohn: bass, back vocals | Reidar I Paulsen: keyboards, back vocals | Music by Christiansson, Carlsohn, Ulvsgärd and Paulsen. | Lyrics by Ulf Christiansson. Released 1994 on Viva Records in Scandinavia/Europe and R.E.X. Records (Nashville, TN) in USA and Canada. Released in Japan on X ZERO Corporation (Toshiba, EMI) Released in Germany on PILA Music. Recorded at Studio Kuling, Örebro, Sweden. Produced and arranged by Jerusalem. Mixed at Musikloftet A/S, Oslo, Norway by Bernt K. G. Austad. After a long break (5 years) the band came back with probably one of the best records they’ve ever done. The release was highly rated by the media in many music reviews. Ulf wrote all the lyrics on a small island (Flatön) outside Gothenburg in just a couple of weeks. Of all the records Jerusalem has done through the years Prophet was the one that took the shortest time, 6-7 weeks all together. 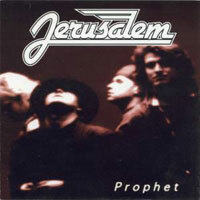 Two videos were made in Holland from Prophet: “City on fire” and “Berlin ’38″. Both videos were produced by Dutch television and Viva records. “City on Fire” was shot live with Jerusalem before an audience of 10,000 people at Flevo-festival in Holland. “Berlin ’38″ was produced and shot with professional dancers picturing the drama that slowly grew in Germany before the Holocast (in black & white). During this time, the band was full of hunger and longing to get together to play again. If you listen to the record you can feel the power and the spiritual release in the music and the vocals. Two singles where produced for radio. “Tomorrow” with b-side “Coming down” (only released on that single) and performed on the Swedish television show “ZAPP” and “The Waiting Zone” (edited for radio), with b-side “Berlin ’38″.